PD-L1 in vitro SimpleStep ELISA (Enzyme-Linked Immunosorbent Assay) kit is designed for the quantitative measurement of PD-L1 protein in serum, plasma, and cell culture supernatant, cell and tissue extracts. We combined our highly specific RabMAb PD-L1 antibody [clone 28-8] (ab205921) with our 90-minute SimpleStep ELISA protocol to create a kit with nearly 2-fold higher sensitivity than our main competitor’s published results. The SimpleStep ELISA employs an affinity tag labeled capture antibody and a reporter conjugated detector antibody which immunocapture the sample analyte in solution. This entire complex (capture antibody/analyte/detector antibody) is in turn immobilized via immunoaffinity of an anti-tag antibody coating the well. To perform the assay, samples or standards are added to the wells, followed by the antibody mix. After incubation, the wells are washed to remove unbound material. TMB substrate is added and during incubation is catalyzed by HRP, generating blue coloration. This reaction is then stopped by addition of Stop Solution completing any color change from blue to yellow. Signal is generated proportionally to the amount of bound analyte and the intensity is measured at 450 nm. Optionally, instead of the endpoint reading, development of TMB can be recorded kinetically at 600 nm. PD-L1 (also known as CD274 or B7-H1) is a membrane bound glycoprotein involved in regulation of the immune system. PD-L1 is expressed on a variety of inflammatory-activated cells as well as some carcinomas and in melanoma. PD-L1 binds to PD-1 and CD80, where it can suppress T cell activation and proliferation as well as induce apoptosis. Levels of PD-L1 are increased in the plasma of cancer patients as well as in cerebrospinal fluid of gliomas. PD-L1 can bind PD-1 in order to regulate T cell apoptosis. 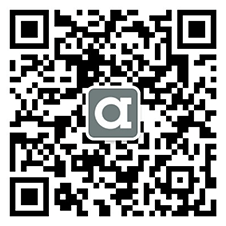 Our Abpromise guarantee covers the use of ab214565 in the following tested applications. Interpolated concentrations of native PD-L1 in human Jurkat stimulated with LPS and IFN-gamma, placenta and thyroid based on a 1,000 µg/mL extract load. The concentrations of PD-L1 were measured in duplicate and interpolated from the PD-L1 standard curve and corrected for sample dilution. The interpolated dilution factor corrected values are plotted (mean +/- SD, n=2). 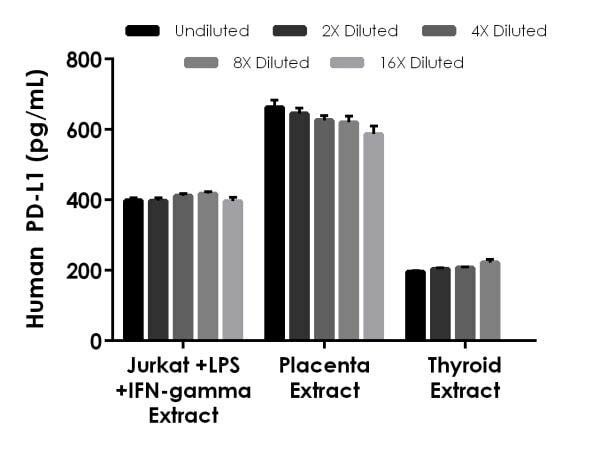 The mean PD-L1 concentration was determined to be 404.3 pg/mL in Jurkat stimulated with LPS and IFN-gamma, 628.4 pg/mL in placenta and 207.5 pg/mL in thyroid extracts. 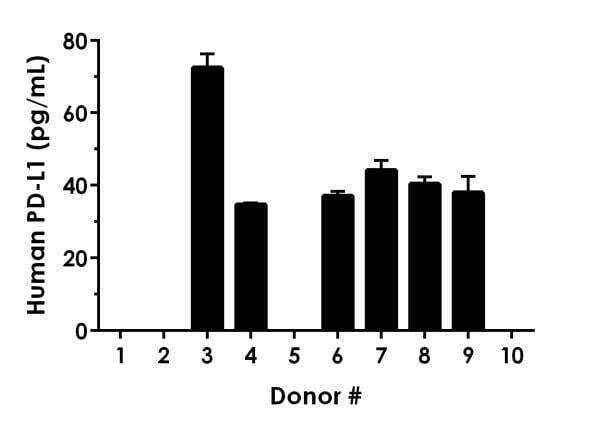 Serum from ten individual healthy human male donors was measured in duplicate. Interpolated dilution factor corrected values are plotted (mean +/- SD, n=2). PD-L1 was measured in 6 donor serum samples and the remaining 4 samples measured less than the lowest point of the PD-L1 standard curve. Of those measured, the mean PD-L1 concentration was determined to be 44.5 pg/mL with a range of 34.4 – 75.3 pg/mL. Example of human PD-L1 standard curve in 1X Cell Extraction Buffer PTR. Example of human PD-L1 standard curve in Sample Diluent NS. Human peripheral blood mononuclear cells were cultured unstimulated or stimulated with 10 µg/mL PHA. Conditioned media was harvested after 48 hours. 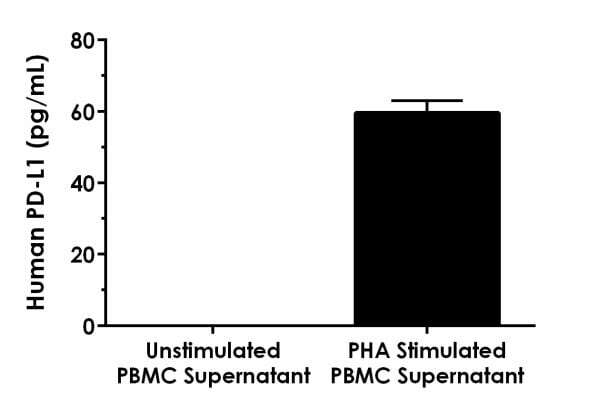 PD-L1 was measured in 100% unstimulated and PHA stimulated PBMC supernatant. 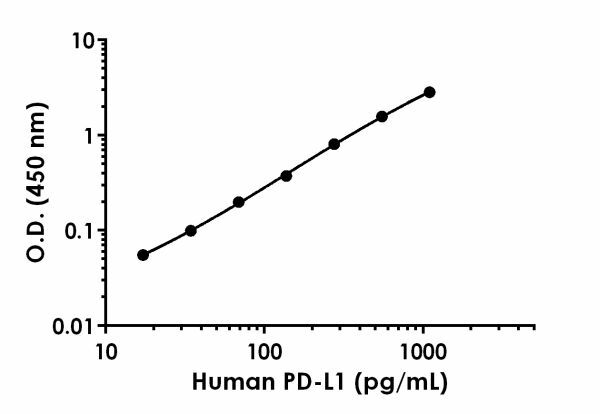 The concentrations of PD-L1 were measured in duplicate and interpolated from the PD-L1 standard curves. The interpolated values are plotted (mean +/- SD, n=2). The mean PD-L1 concentration was determined to be 59.7 pg/mL in PHA stimulated PBMC supernatant. There was no detectable signal in unstimulated supernatant.